Temecula, California (January 20, 2017) – For the first time since Sycamore Terrace Apartments was built, recycling dumpsters have been placed in their Temecula apartments. 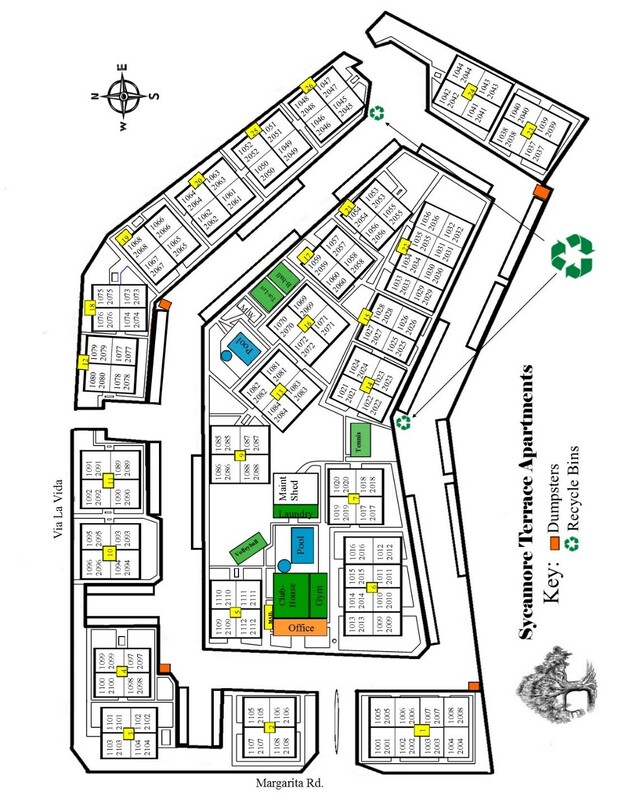 Starting this month, Waste Solutions will be supplying the Sycamore Terrace community with recycling receptacles. The staff hope that this can encourage residents to take part in the green movement and do their part in helping Mother Earth. According to the U.S. Environmental Protection Agency (EPA), the average person generates over 4 pounds of trash every day. Consequently, the EPA also says that 75 percent of the American waste stream is recyclable, but only about 30 percent of it is recycled. It’s no wonder that so many people resolve to “reduce, reuse and recycle” more this year. Since Sycamore Terrace Apartments values their resident’s quality of life, environmentally friendly practices are always observed in their apartments in Temecula, CA. To further improve on this, management has elected to provide residents with recycling receptacles. The recycling bins will be located in two different areas for the guests’ convenience. They can be found within the dumpster enclosures located near buildings 14 and 26. The locations have been marked in the map included here, and the recycling bins have a distinct white color so that they can be easily seen by guests who wish to participate. The staff only ask that residents make sure to pay close attention to the items they are throwing away. For instance, only cardboard, plastic, glass, paper and other items made of recyclable materials will be allowed to be put inside the bin. Make it a habit to look for the recycling symbols commonly printed on packages and wrappers of products as well. These items will also be appropriate to throw into the bins. Recycling not only helps the environment, but conserves resources, reduces costs, creates jobs, and generates revenue. All in all, it improves life in general. For more information, go to SycamoreTerraceTemecula.com. Located at the heart of Temecula, Sycamore Terrace Apartments offers one and two bedroom apartments as well as management services. Each unit is state-of-the art, newly remodeled and furnished to accommodate the tastes of residents. Sycamore Terrace boasts of a rich sense of community, convenient proximity to countless amenities and local attractions, as well as the unique luxuries provided only to valued guests.